Latifah Namuyimba also known as Bad Black has been released on bail from Luzira prison where she has been for close to a month. Bad Black was arrested the day Gadaffi died on allegations on embezzling funds. She has been reporting to the Mabua road based Anti Corruption and War Crimes Court based in Kololo in Kampala. Members of her gal brigade who were all clad in tight leggings, bikers and some of her followers were camping outside the court premises since morning when she was produced in court. She was released on Thursday afternoon after her Wednesday attempt to get bail failed. Bad Black's passport was locked up in one of the offices by an officer who is currently in China and yet it was one of the requirements to get bail. 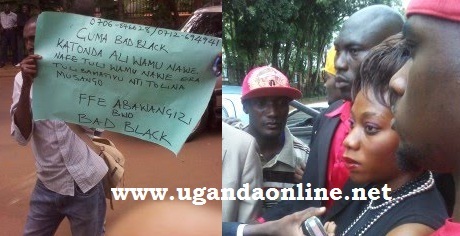 On being released Bad Black's convoy drove to Wampewo Avenue before connecting to Yusuf Lule road which route they used to go to town. The headed straight on Yusuf Lule road where they needed to alert other followers that she had been released. From Wilson road the convoy headed straight to International Hospital in Namuwongo where they had to carry out a through check up on her. She was having a terrible headache. The doctors needed to check on the breasts too. At about 4:00pm, the ML Benz, silver in colour drove towards Munyonyo where it disappeared from. Meanwhile she was in the company of Club Rouge's Nickita Bachu and Gareth implying that later in the night, She must appear at Club Rouge to start from where she stopped.